We are all aware of Thala Ajith’s passion for biking. 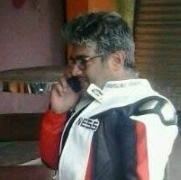 We had received news from our sources that Thala had bought a brand new BMW bike worth rupees 24 lakhs recently. The actor decided to take the two wheeled monster for a little ride yesterday, riding it all the way from Chennai to Bangaluru via the Salem road. A lot of people were delighted watching Ajith cruise past them dressed in a white and red racing gear. It is said that the actor stopped midway for supper in a small roadside hotel in Kattukotai Village. Needless to say, a lot of people gathered around the 'Ultimate Star'. Thala was overjoyed to spend some time with them, taking pictures and signing autographs. Ajith also requested them to have dinner with him in the hotel. News sources say that Ajith had gone to Bengaluru for a little rest. Well, there’s nothing better than starting a break with doing what you love doing.